Prefilters are a specific type of piggybacks (please refer to this article to learn more about piggybacks). They determine how many requests are received from a particular SSP about a user. Prefilters actually tell the SSP that you (or actually, we, Yieldr, on behalf of you) find a user interesting. If this happens, the SSP then answers with sending over all requests coming from this particular user. Within Yieldr we have prefilters set up for Google, Appnexus and Bidswitch. This means that (in retargeting campaigns) the chances of finding back a particular user increase significantly when you add prefilters, and you will be able to apply a higher amount of media pressure as a result. It is good practice to align the usage of prefilters with your funnel. This means that you have to select the appropriate prefilter for the appropriate funnel step. For example: a user that only visits the homepage is likely not very interested in purchasing your product. Unless you have an upper funnel retargeting campaign up and running, you won’t need a prefilter for this step. 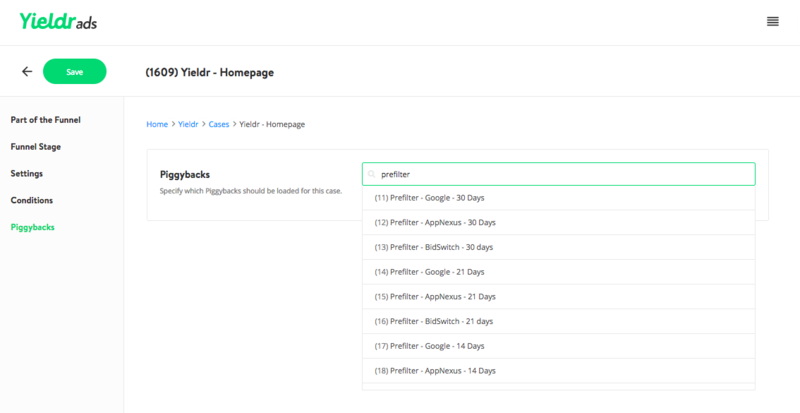 We have already created prefilters for you to use and add to your audience cases. 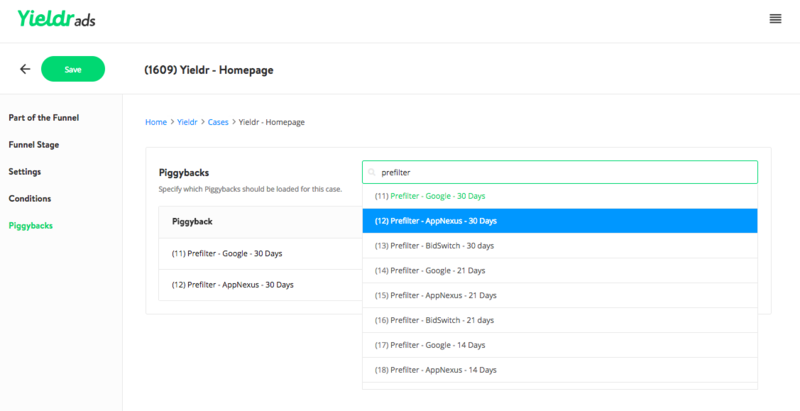 Navigate to the "Tools > Piggybacks" section in the left navigation bar to see the overview of all available prefilters. To add a prefilter to your audience cases, navigate to "Advertiser Name > Cases" section in the left navigation bar and select the case you want to edit. Go to the "Piggybacks" tab and type "Prefilter". You will now see the predefined prefilters for the different SSPs. 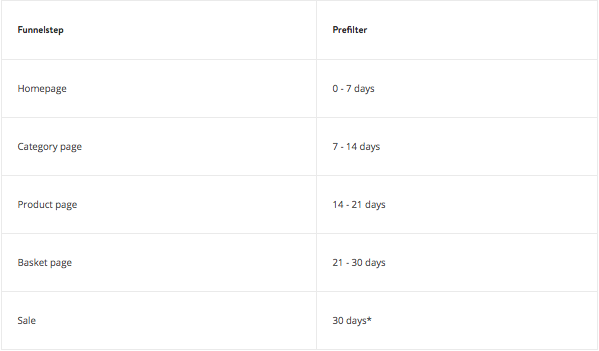 For each SSP there is a 7-day, 14-day, 21-day and 30-day prefilters available. Like the names of the different prefilters suggest, these will sync your users with the respective exchange for respective number of days. To add a prefilter to your audience case, click its name from the dropdown and they will be added to your case. When you've added all your prefilters of choice, click "Save" at the top left of your screen to save your changes to the audience case.